The term applied in the Old Testament to the kings of Egypt. The word is derived from the Egyptian "pr-'o" (= "great house"), which originally denoted the royal palace with the buildings and grounds attached to it, although the metonymy which transferred its meaning from the palace to the king developed only gradually, as in "Sublime Porte." "Pr-'o" seems to occur first in the fourth dynasty, and until the twelfth it connotes only the building, although by the sixteenth it is occasionally applied to the king. In documents of the eighteenth dynasty it is the regular appellation of the monarch, so that by the twenty-fifth "Pr-'o Nk'w" is found as the precise equivalent of the Biblical "Pharaoh-Necho," "pr-'o" being used in the simple sense of "king," i.e., "Pharaoh." In the Old Testament eleven kings of Egypt are mentioned. 1. The Pharaoh of Abraham (Gen. xii. 14-20) According to the account given of this king, he took Sarai as a member of his harem, being led by Abram to suppose she was his sister instead of his wife. For this unwitting act Pharaoh suffered affliction from Yhwh, until he discovered his error, which he immediately rectified. In view of the fact that A'bram's date is far anterior to the eighteenth dynasty, before which "pr-'o" was very seldom used in the sense of "king," the narrative in Genesis is not altogether free from difficulty, and the data afforded by it are so meager that it is impossible to attempt any identification with the sources thus far accessible. 2. The Pharaoh of Joseph (Gen. xxxix.-1.). The story of Joseph, or at least the redaction of it, can scarcely be of early date, both on account of the title of "Pharaoh" and of the use of (Gen. xli. 1, etc.) as the name of the Nile, since the Egyptian original of the term was not used until the Middle Kingdom. The proper names occurring in the story (Gen. xli. 45), moreover—Potipherah ("P-ti-p-R'," gift of Ra), Asenath ("[N]esNeith," she who is Neith's), and Zaphnath-paaneah ("Zt-p-ntr-e-f-'nkh," Saith the god: "He liveth")—represent forms which are common after the twenty-fifth dynasty and which do not occur before it. No certain record of a seven years' famine, like that recorded in the history of Joseph, exists, although a very late Egyptian inscription at the Cataracts states that there was such a famine in the reign of one of the earliest kings, possibly about 3000 B.C. The present knowledge of the economic administration of ancient Egypt is insufficient to determine the accuracy of the account that a fifth of the grain was stored up to provide against famine. It is likewise uncertain whether land and live stock could be sold to the king for this reserve supply, so that the Pharaoh could finally own one-fifth of the entire country (Gen. xli. 33-36, xlvii. 14-26). Here again, therefore, it is difficult if not impossible to identify the ruler of Egypt intended by the narrative of Joseph, although he was, perhaps, one of the Hyksos, or "foreign," dynasty. The old view that this Pharaoh was Apôphis II seems quite improbable, but the general historicity of the account is confirmed by the fact that according to two El-Amarna tablets a Semite occupied a position in Egypt quite similar to that held by Joseph (comp. Jew. Encyc. vii. 252a), while Merneptaḥ states that Goshen had been given as a pasture land to "foreign" herdsmen from southern Canaan (comp. Jew. Encyc. viii. 676a). 3. The Pharaoh of the Exodus (Ex. i.-ii.). As in the case of the Pharaoh of Joseph, the use of "Ye'or" to denote the Nile apparently speaks for a comparatively late date of the Hebrew redaction of the story of the Exodus. The ruler intended by the narrative is usually regarded as Rameses II. of the nineteenth dynasty, who was preeminent as a builder and was active at Pithom, while he may well have been the founder of Raamses in Goshen (Ex. i. 11). According to another theory, he was Amenhotep III. or IV. of the eighteenth dynasty, but this hypothesis, which is based on El-Amarna letters which record the movements of the "Ḥabiri" (Hebrews?) in Palestine, seems on the whole less probable than the generally accepted view. 4. The Pharaoh of the Oppession (Ex. v.—xiv.). This ruler is almost universally regarded as Merneptaḥ II., one of whose inscriptions, dating from the fifth year of his short reign, contains the only Egyptian allusion to the Hebrews known thus far. This passage reads as follows: "Israel [Y-s-ir(a)-'a-ra] is annihilated without any growth; Palestine has become like a widow for Egypt." While this is frequently taken as a proof that the Israelites were already settled in Palestine in Merneptaḥ's reign, such an assumption is by no means necessary. 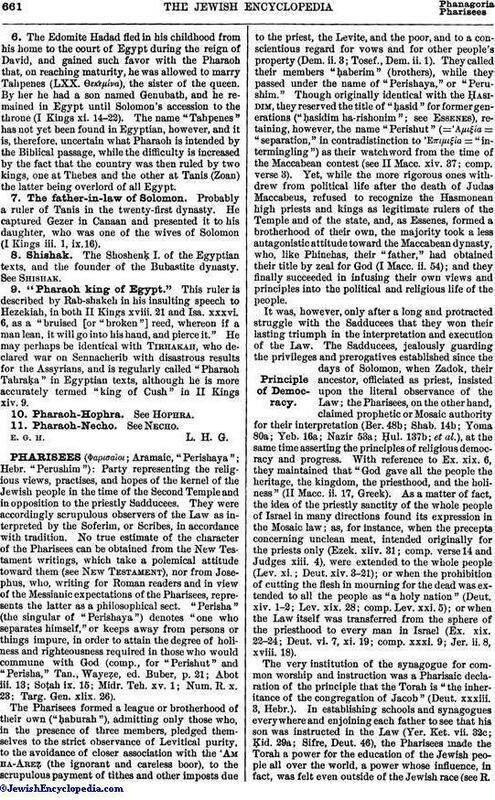 During both this and the following reigns, moreover, there is a significant lack of any record of Egyptian expeditions to the quarries of Sinai, near which the Israelites are said to have wandered for forty years; and, on the other hand, there is no Hebrew account of any Egyptian invasion of Palestine before the one made by Shishak in the twenty-fifth dynasty, unless the "hornet" of Ex. xxiii. 28, Deut. vii. 20, and Josh. xxiv. 12 refers to Rameses III. of the twentieth dynasty, who ravaged Philistia. 5. Bithiah, the wife of Mered. Mentioned in I Chron. iv. 18 as "the daughter of Pharaoh"; but it is impossible to determine to what king of Egypt the passage refers, and in this case "Pharaoh" may even be a mere proper name, perhaps a loan-word assumed by a Hebrew. 6. The Edomite Hadad fled in his childhood from his home to the court of Egypt during the reign of David, and gained such favor with the Pharaoh that, on reaching maturity, he was allowed to marry Tahpenes (LXX. Θεκεμίνα), the sister of the queen. By her he had a son named Genubath, and he remained in Egypt until Solomon's accession to the throne (I Kings xi. 14-22). 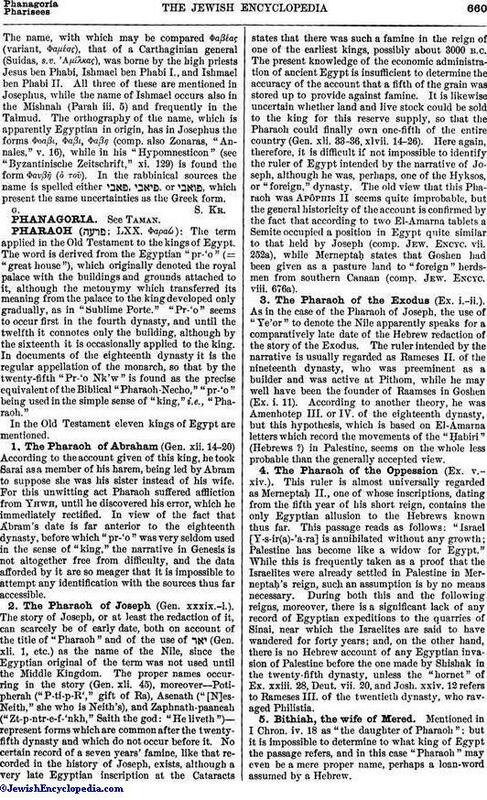 The name "Tahpenes" has not yet been found in Egyptian, however, and it is, therefore, uncertain what Pharaoh is intended by the Biblical passage, while the difficulty is increased by the fact that the country was then ruled by two kings, one at Thebes and the other at Tanis (Zoan) the latter being overlord of all Egypt. 7. The father-in-law of Solomon. Probably a ruler of Tanis in the twenty-first dynasty. He captured Gezer in Canaan and presented it to his daughter, who was one of the wives of Solomon (I Kings iii. 1, ix. 16). 8. Shishak. The Shoshenḳ I. of the Egyptian texts, and the founder of the Bubastite dynasty. See Shishak. 9. "Pharaoh king of Egypt." This ruler is described by Rab-shakeh in his insulting speech to Hezekiah, in both II Kings xviii. 21 and Isa. xxxvi. 6, as a "bruised [or "broken"] reed, whereon if a man lean, it will go into his hand, and pierce it." He may perhaps be identical with Tirhakah, who declared war on Sennacherib with disastrous results for the Assyrians, and is regularly called "Pharaoh Tahraḳa" in Egyptian texts, although he is more accurately termed "king of Cush" in II Kings xiv. 9. E. G. H. L. H. G.